I hope you had a wonderful holiday! Are you ready for the new year? Wow, 2013?! Sometimes hard to believe those numbers. 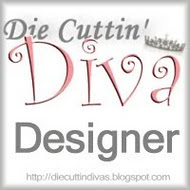 Well, I'm happy to be back on the Die Cuttin' Divas Design Team. We have a great challenge for you for this first week in 2013--a Sketch Challenge. Here's the card I made. My brother's birthday was December 27 (yeah, he kinda gets cheated! ), and he's older than me! ha-ha! So I was trying to make a funny card about getting older. I used Life's a Party for the wording, and found the funny tombstone in Simply Charmed. The striped paper is from DCWV "All About Boys." I popped up the oval and the tombstone on foam squares. And finished the inside with the matching striped paper at the left end of the card. and they will donate one stamp set of the winner's choice! We hope you'll play along with us this week for our Sketch Challenge. You'll have one week to plan, create, and submit your project. Please remember to include which die cut you used and a link back to Die Cuttin' Divas. What a cute card. Love the face on the tombstone and the "what?" sentiment! Such a fun card Pat!! LOVE your take on the sketch!! TFS and Happy New Year! Great card. Your site looks FABULOUS! I love the new touches you have made. Glad you are back on DCD team. I made a few changes for 2013. I hope the picture thumbnails work! Happy New Year hope you enjoyed your celebration... Can't wait to see more in 2013~ Enjoy your holiday! Love the card. Glad you are back on the DT. Happy New Year! What a great card, Pat!! I'am glad that you are back on the DCD team!!! Your blog looks great!! Very fun card Loving this sketch and have to play with it today. What a cute card, that font is fantastic! The card you made for your hairdesser below is absolutely adoralbe as well, that image is great---I'm a runner, and have had several near mishaps, so I can only imagine!!! :) Happy New Year!! oooh how cute is this! I love the expression on the tombstone! Great paper choice! This card is so cute Pat! Hope you had a wonderful Holiday! We were "over your way" on Christmas Day. went to my daughters for Christmas Dinner, boy that is a far drive! Very cute card Pat! Stopping by to wish you a Happy New Year my friend and cheers to a fantastic 2013!! Thank you for joining us at Little Scrap pieces. What a CUTE & FUNNY card!I love it!